Grand Central Market, Downtown LA’s daily food stall feasting grounds, is turning 100 this year -- and for a centenarian, the old gal has done well in keeping up with the times. “Evolution” has been a throughline for the market’s dynamic lineup of vendors over the decades, tracing back from its days as an open grocery to its modern “destination dining” reputation that draws James Beard-quality chefs. 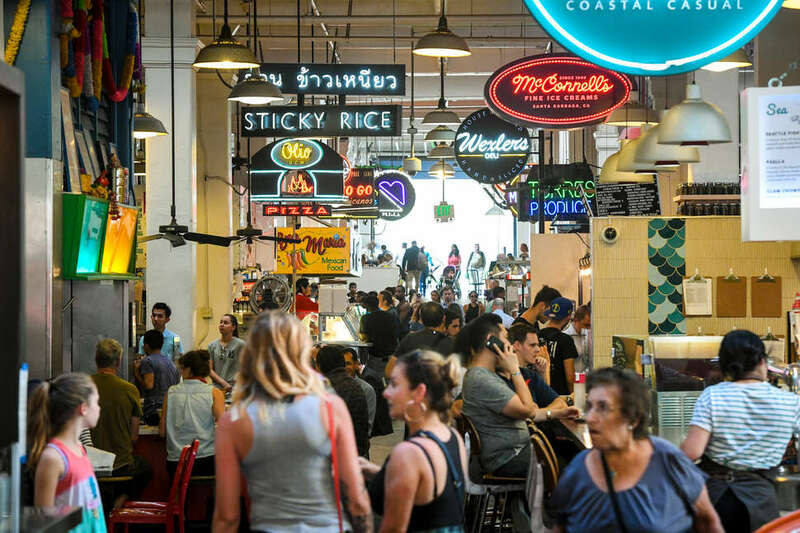 Of the 30+ stalls in GCM, these are most worthy of your attention during your next visit for lunch, dinner, or some amalgam of the two meals (with a walk scheduled in-between, hopefully). Thai counter Sticky Rice is considered the paragon vendor of Grand Central’s new wave of food stalls that was ushered in back in 2013. Since then, the shop’s had a strong enough following to expand to the adjoining stall (Sticky Rice 2), and it’s easy to see why with dishes like the khao soi noodle soup. 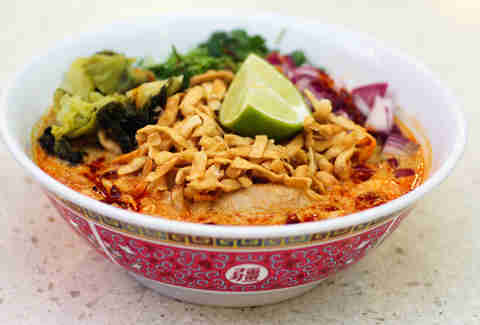 A seamless blend of yellow and red curry, juicy chicken thighs wade in the hearty bowl of coconut broth, lime, and chili oil with egg noodles two ways -- boiled or fried -- and sprinkled on top with coconut sugar. 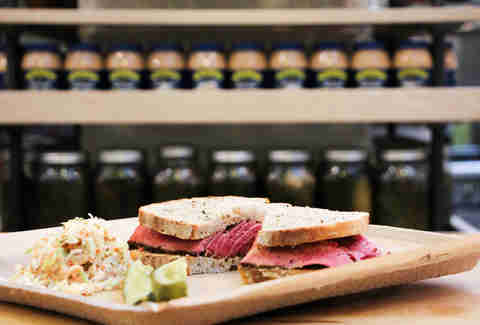 The OG nosh spot that has spun off into restaurants in Santa Monica and, now, Century City is home to some of LA’s top pastrami -- a high bar to clear with the abundance of storied Jewish delis in town. For those seeking Kosher comfort food, you’ll find it in the form of the The OG sandwich with pastrami (cut to your preference of lean or fatty) and mustard on rye. If you take your mustard seriously (and who doesn’t? ), forego the traditional spicy brown or mild yellow in favor of the Beaver Brand sweet hot mustard made with honey that provides a delayed, wasabi-like spice. Not many career paths have been carried over from Medieval times, but thankfully cheese mongering is alive and well in the modern era. 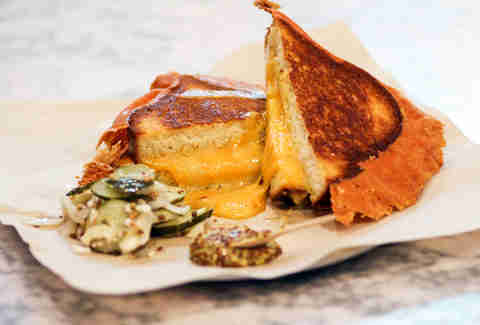 The mongers at DTLA Cheese also happen to manufacture a pristine grilled cheese sandwich. The three-Cheddar blend (two from Wisconsin, the other from the UK) is mixed with local mozzarella for added goo-ification, then slid between two slices of brioche -- themselves lined with a crispy and salty Cheddar crust -- that manage to evenly absorb the oils and fats from the dairy. The Filipino term “sari-sari” translates to “variety,” and damn if this food counter doesn’t pack a world of diverse ingredients into a streamlined, 10-entree menu. 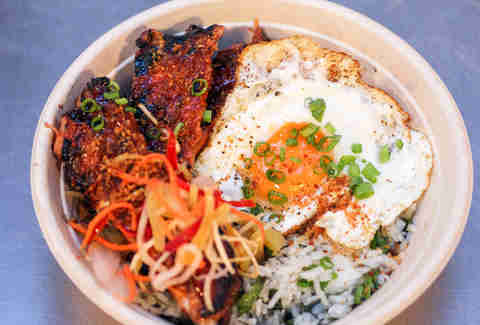 Let the Pinoy BBQ rice bowl from James Beard-nominated chef Margarita Manzke be your jumping off point: pork ribs glazed with brown sugar and pineapple juice, then charred alongside toasted garlic rice, a fried egg, and the counter’s green papaya relish that finds into way into several dishes. Make room for a daytime dessert course with the halo-halo -- it’s watermelon shaved ice, sandwiched between leche flan and coconut pandan ice cream. Texas BBQ is notorious for drawing ludicrously long lines. Eaters in Los Angeles are notorious for waiting in ludicrously long lines. 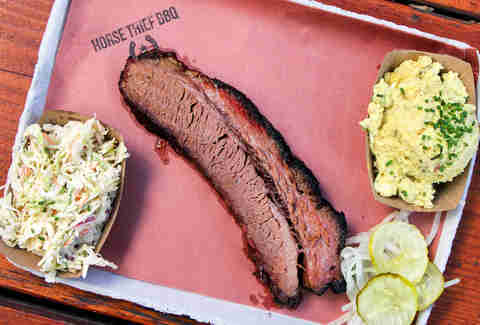 However, the wafting meat scents from an Ole Hickory smoker should be a clear signal that Horse Thief is worth the wait. Spend a weekend morning as the Austinites do: on an outdoor patio with a Shiner Bock and some brisket (whether in sliced or taco form) that’s got a fat cap flush with smooth white oak flavor from having been smoked for up to 16 hours. The sweet mayo slaw and potato salad make for excellent sidecars. What are you typically doing at 4am? The answer is sleeping, or maybe getting up to pee, and yet 4am is the golden hour for Tomas Martinez -- who’s been dishing out tacos around Grand Central Market since 1972 -- as he starts stewing up his next great batch of carnitas. 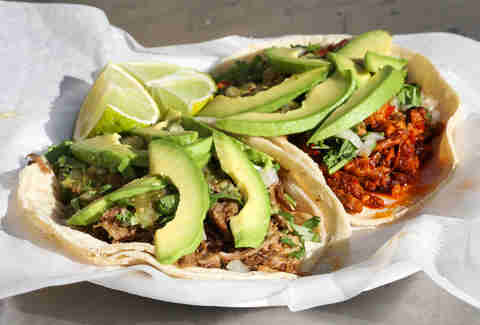 As more marquees are added to the food hall year after year, Tacos Tumbras a Tomas remains unflinching, offering up tacos with heaping helpings of carnitas and velvety avocado for welcomingly cheap prices. 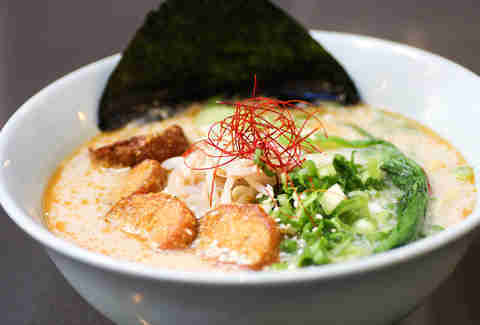 Even though Ramen Hood’s bowls of ramen are vegan, you won’t miss a single hint of umami-ness. The broth is a kelp and shiitake mushroom stock mixed with white miso, and the key ingredient: roasted sunflower seeds. A vegan egg is achieved with a “white” made of soy milk containing a “yolk” of yeast that can be popped, much like its avian equivalent. The OG ramen is rounded out with a bevy of vegetables (bean sprouts, scallions, bok choy) ,and fried pucks of king oyster mushrooms that anchor the texture of the dish. The newest addition to Grand Central Market, PBJ.LA heightens the classic brown bag peanut butter & jelly sandwiches of your childhood (and those more desperate college years) with unique pairings that are organic and made from scratch. 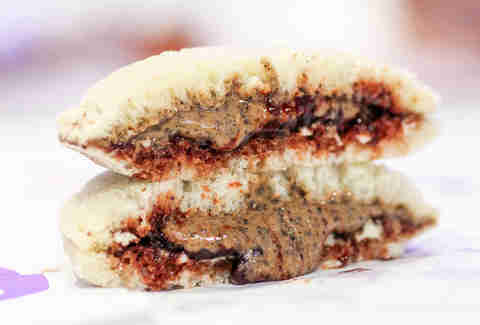 The go-to PB&J is the Red Eye, which spreads a dark chocolate raspberry jam and an espresso-infused peanut butter made with beans from Jaguar Forest in Mexico on to classic white bread. The sandwiches are pressed for de-crusting with a custom crimper machine, and can be toasted upon request. In a city where “not bad” is considered praise for most pizza joints, adding another counter-service pizzeria to your quick-but-tasty lunch list is invaluable. Having migrated from its original location in Beverly Grove, Olio continues to make its dough fresh in-house daily, pulling finished pies out of the vintage tiled oven in a matter of minutes. 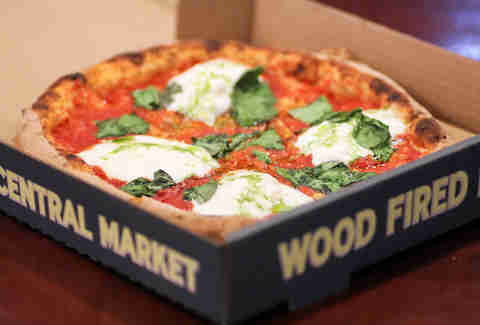 The margherita comes in a generously-measured personal size, layered with dollops of burrata, basil, and extra virgin oil. 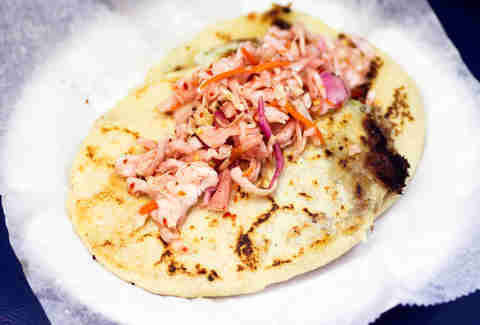 Sean Cooley is an LA-based writer who covers food, travel, and events. He did not know that Guy Fieri was once nearly trampled to death by a horse. Follow his spirit quest on Instagram @SeanCoolish.